My Herbalife Journey: Our annual family holiday. So if you had read my very first post you will know that I would usually lose a vast amount of weight before our annual getaway. Getting to about 8.4 stone and actually starving myself for the whole month prior to reach that all important goal. I have a suitcase of "holiday clothes" which only fit when I'm under 8.7 stone so it's essential I reach this goal weight. Now I'm on Herbalife I don't need to starve myself. I reached 9.1 before we left and all my clothes fit! Why? Because my muscles have been fed property and fat turned to muscle. 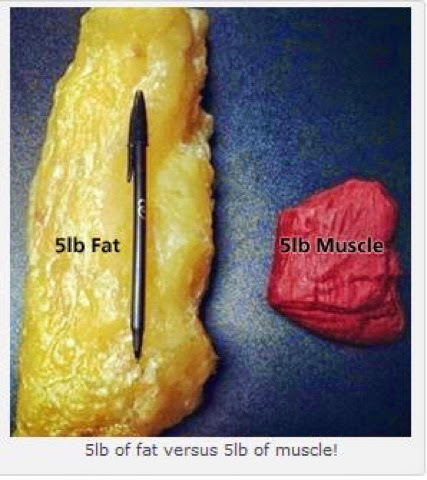 Muscle weighs more than fat so I have shrunk and yet still weigh more. I understand much more now which helps with how I feed my body. This picture really explains why my holiday clothes still fit even though I'm a stone heavier.